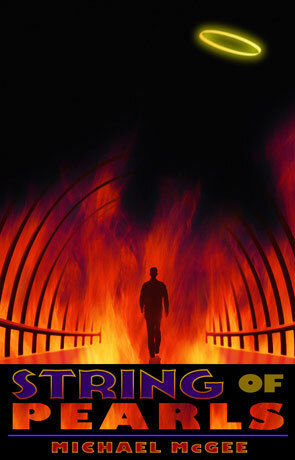 String of Pearls asks the question; what if Heaven turned out to be just as dangerous as Hell? Dayson Snow has spent most of his life fighting against the greed of multinational corporations and when he arrives in Washington DC with Yumi Mihara - the love of his life - he becomes embroiled in a race to prevent a humanitarian disaster in Africa. Things go bad for him when he crosses the path of the dangerous assassin Jean LaFourche (who has been altered by some sort of miracle) and in his attempts to foil LaFourche's latest hit Dayson becomes another of his victims. He awakes to find himself in an Afterlife that appears to be in worse shape than the world he just left and is forced to serve the occupants of Heaven which faces a serious crisis as Legions of the Damned appear to have been loosed upon the realm. To right the problem and win back his old life he must travel to the very depths of Hell which appears quite unlike anything he ever imagined. There is a lot going on in this novel, a blend of genres combines with symbolism and elements of philosophy which results in a book that is quite different. I must admit it did take me a while to get into this novel, the pace seems a little uneven and the way we are introduced to characters from the various plains of reality forces you to really pay attention or lose the thread. The main character also takes a while to relate to and bond with. It is however worth persevering with some really great ideas and a strong plot, the novel builds in power as it progresses and has a few genuinely unexpected twists. The real strength of the book lies in the ideas, instead of a white-washed Heaven full of happy shining people the afterlife presented here is more like an extension of the previous life with some of the inhabitant's character traits amplified while others just struggle through this next stage in their existence. This extends to the other areas of the afterlife too, both purgatory and hell are very different than the traditional view and this deconstruction is very effective, promoting a great deal of thought. Running just below the surface is a commentary of humanity and the whole story is designed to offer up this study of homo sapien. The other main theme is of course religion and the idea of the spirit and these subjects are handled with a great deal of maturity and intelligence. There isn't any push towards one opinion or the other but instead it's left up to the reader to make their own mind up - a balance that many novels that tackle the theme of religion fail to achieve. I'd have to say that String of Pearls isn't the easiest book to read, but I also can't imagine that given the many ideas presented here that it ever could be. It is one of those novels that really does make you think long after you've read the last page; it's dynamic, intelligent and thought-provoking in equal measure - anyone who wants something a bit deeper than the average read would do well to give it a go. Written on 29th March 2012 by Ant.